The North Fork Kings Groundwater Sustainability Agency (NFKGSA or Agency) recently formed with the primary purpose of compliance with the Sustainable Groundwater Management Act (SGMA). 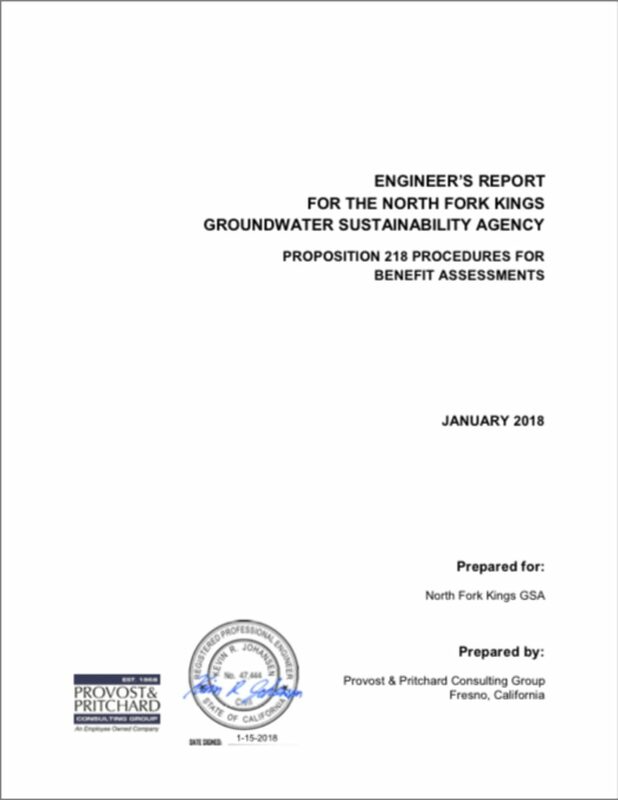 As a Groundwater Sustainability Agency (GSA), the Agency may develop, adopt, and implement a Groundwater Sustainability Plan (GSP) for sustainable management of groundwater for that portion of the Kings Subbasin (Subbasin) underlying the Agency. The newly formed Agency needs to implement an assessment rate structure that is sufficient to fund Agency operations and required activities pursuant to SGMA. The NFKGSA will develop, in coordination with other GSAs in the Kings Subbasin, a GSP that provides for achieving groundwater sustainability in the Kings Subbasin of the San Joaquin Valley Groundwater Basin underlying the Agency by January 2040. SGMA requires that a GSP be submitted to the California Department of Water Resources (DWR) by January 31, 2020 since the Kings Subbasin is considered a high priority, critically overdrafted subbasin. Based on the Agency’s needs, the NFKGSA Board of Directors is requesting landowner approval to levy assessments to generate sufficient revenue to fund both annual Agency operation costs and expenses associated with the development and implementation of a GSP. The annual operational costs have already begun and are used to fund Agency operations and activities required by SGMA, including retaining consulting firms and legal counsel to provide Agency oversight and lead the Agency through the steps for SGMA compliance. Expenses consist of administrative support, GSP development, and GSP implementation, with GSP development occurring over the next several years and GSA administration and GSP implementation anticipated to be on-going expenses. The administrative annual expenses include an assumed annual 3% inflation factor. The assessments are planned to apply equally to all assessable lands within the Agency’s boundaries. The Assessment Roll provided in Attachment D identifies the acreage for each assessable parcel according to the 2017 tax rolls of Fresno County and Attachment E identifies the acreage for each assessable parcel according to the 2017 tax rolls of Kings County. The following table provides an example schedule of the proposed assessments during the next five years that are the subject of this Proposition 218 Engineer’s Report. The actual assessment rate will be set annually by the Board, based on the budget needs, but will not exceed the proposed maximum rate. Assessments will continue beyond Fiscal Year 2022-23, but at this time the assessment rate after this initial five-year period is unknown because the GSP Implementation costs will not be fully determined until the GSP is developed. The projects that will be proposed as part of the GSP implementation to attain sustainability and maintain the threshold levels established in the GSP will likely require supplemental funding and assessments greater than the maximum assessments recommended in this report, and approval by the landowners in a future Proposition 218 election will be required.